Will Dell’s secret 18-inch tablet herald the rise of the Super Tablet? Though the company hasn’t said a word about it publicly, Dell has an 18-inch tablet in development that I recently learned about at a company event. I’ll avoid calling it an iPad killer largely because it isn’t. In fact, it isn’t an anything killer, because nothing like it exists to kill. As Apple did with the iPad, Dell is trying to open up an entirely new market with this jumbo-sized tablet. You won’t be using this one to read books or play handheld games – you’ll use it in different ways entirely. Dell, and other companies looking at this form factor, are likely going to go bigger before they go smaller. Some future Super Tablets may even approach 42-inch TV sizes. Sound familiar? Microsoft Surface covered this territory before anything else, and it was far different than the now popular Surface Tablet. Let’s take a look at where Microsoft’s innovative proto-tablet left off, and where the Super Tablet category may pick up. 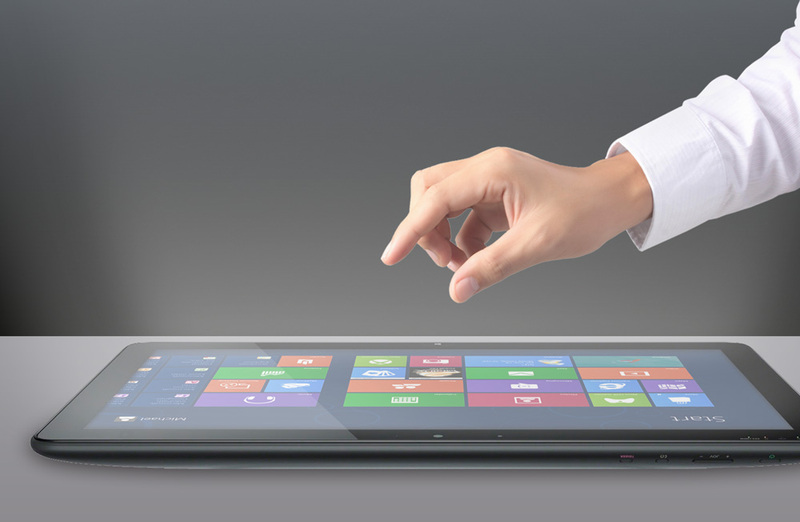 Now that Windows 8 has arrived, the move to a true touch-based OS is causing people to think differently about hardware. These super-sized tablets are only one of what will likely be stream of ever more creative touch hardware. Like every new OS, manufacturers initially try to fit it in existing form factors, and discover over time that other forms will work better. The best initial example of a fresh form factor was actually the Surface Tablet, which blended smartphone features like a kickstand and keyboard accessory with the existing tablet form factor, but with a laptop-like panoramic screen. It is a blend of technologies that likely wouldn’t have existed if it hadn’t been for Windows 8. Windows 8 is getting people to think of things differently, and that means the limits of traditional forms and sizes will increasingly be tested. One of the most interesting products that few people ever got to try was Microsoft’s Surface table. At one AMD event, I had the opportunity to sit and play with one for most of an evening, and became so enamored with it I actually tried to buy one several times. Unfortunately, I could never find the right mix of Samsung and Microsoft executives to take my money, so that desire was never met. The Surface was uniquely fun because you played on it flat. It’s like playing a board game with multiple people, but where the game is actually a video game, so you can blend animation with traditional board-game features to make it more fun. Kind of like that chess game in Star Wars, but you could also play games made specifically for the medium. My favorite was a strategy game where you placed weapons to destroy aliens (the green kind) who were invading your solar system. I found this game addictive enough to want to pay $7,000 for the table. This is the area that these Super Tablets will explore. They are more than a portable all-in-one computer, they are a way to experience a display as you would a board game. This approach is not only better for group gaming, but better for virtual puzzles and drawing where your surface – no pun intended – functions more like a large piece of canvas. Of course, that’s not where the possibilities end. It could also be better used to keep track of a game while sitting with your spouse who is watching one of “their” movies (you know what I mean), or by said spouse playing a social game while they pretend to watch one of your action flicks (my wife never does this). If a 10-inch iPad was OK for this second-screen experience, an 18-inch or larger lap-sized display will be even better. This size would also excel for streaming video when you’re traveling and want to watch TV as a group. In short, Super Tablets may herald the return of the portable TV, but one that is both far more portable than the old CRT-based sets, potentially has a larger screen, and is far more useful (add a keyboard and you have a good-sized all-in-one). I think we are all waiting for that next Amazing thing and with Steve Jobs gone it appears less and less likely that Apple will be stepping up. This opens the door for other firms to try to find the magic and a larger tablet has a huge potential to be that next thing if content, like that game I mentioned, can be found to make it as magical as the iPad initially was. Whether or not this product achieves that magic the more companies that try to find that magic product the more likely will get something amazing and I live for amazing products. And I’m still waiting to play that damned strategy game so if it doesn’t show up on this 18” tablet I’m going to be royally pissed.